Helen wanted a plain wedding ring that would not draw attention away from the beautiful design and stunning stones of her engagement ring. 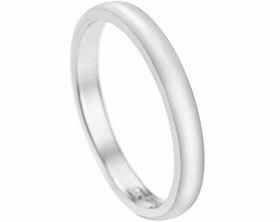 The bespoke hand worked palladium wedding ring is 2mm wide with a gentle curve profile. A highly polished finish completes this band.